Death Star Canteen by Eddie Izzard is a golden oldie that cracks me up every time, enjoy! ...but is this how the future of Star Wars is going to look? 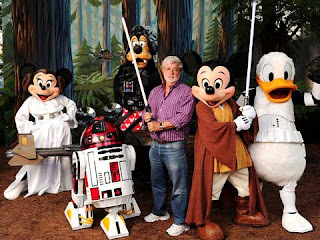 LucasFilm, the makers of Star Wars, founded and solely owned by George Lucas, has been purchased by Disney for $4.05 Billion! Some say Star Wars is not for kids and this is the death of Star Wars, the founder says it's a way to keep the films alive and in good hands. George explains that he wants to retire and "be a fan" for a change, watch the brief interview on Star Wars' future [here].